As with 1954 and 1961, the 1966 Formula One season marked the beginning of a new era. The sport had entered into somewhat of an engineering dark age beginning in 1961, as the FIA mysteriously decided to reduce maximum engine capacity from 2.5 to 1.5 liters, essentially demoting the category to Formula Two-specifications. As the years went by manufacturers like Ferrari, BRM, Porsche, Coventry Climax and Honda tried their best to extract some power from minuscule flat-4’s, V8’s and even flat-12’s and V12’s. Figures above 220 horsepower were incredibly rare though, which meant the position of Formula One as the pinnacle of motorsport was becoming untenable. The tiny 1.5L naturally aspirated engines were unfit for service in the upper echelons of motorsport. With major technological advancements in GT and prototype racing taking place around the same time, the F1-cars were in danger of being outrun by much more powerful machines like the Ferrari 250 GTO, Shelby Cobra and Ford GT40. Something had to be done to reaffirm the sport’s status as the ultimate racing championship. F1’s biggest boffins stuck their heads together to find a solution. Their best and brightest idea was very simple: just double the allowable engine size and watch the cars speed off into oblivion. The plan seemed brilliant, but there was one slight problem: nobody had notified any of the teams. In their haste to set things right, F1’s management had forgotten to give them enough time to actually design and build an entirely new generation of engines. ncreasingly more powerful GT and prototype cars were threatening to overtake F1. Thanks to this unfortunate oversight, the majority of teams were stuck with outdated 1.5L units. One of those was Team Lotus. Under the expert guidance of founder Colin Chapman, Lotus had been extremely successful in the 1.5L era. Chapman’s brilliant mind produced the template of all modern F1 cars during this time, as he developed the revolutionary stressed monocoque 25. This car and its successor the 33, driven by legendary driver Jim Clark, racked up 19 Grand Prix wins and two Driver’s Championships between 1962 and 1965. 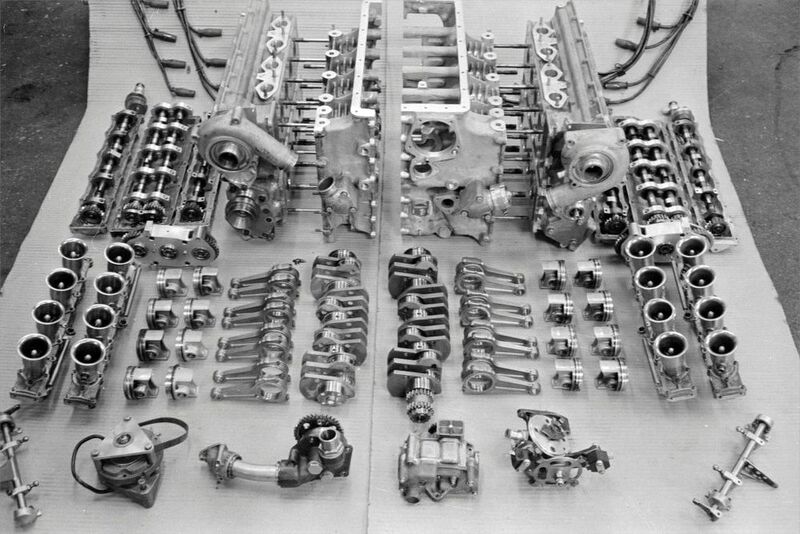 Lotus had been waiting in vain for an insane flat-16 Coventry Climax engine. Near the end of their successful run, Team Lotus were looking for a replacement for the Coventry Climax FWMV 1.5L V8 they’d been using, as it had reached its developmental limit. Coventry Climax loyally responded by starting work on a incredibly ambitious project. Drawing inspiration from the infamous BRM Type 15 V16 on which Coventry Climax engineer Harry Mundy had worked, the plan was to fashion a 1.5L flat-16 out of two 750cc flat-8 engines with a common central spur gear. However, the FWMWsuffered from incurable vibration issues, leaving the proposed 3.0L successor to the prototype dead in the water. Team Lotus and Coventry Climax parted ways after this debacle, as Coventry Climax left motorsport entirely after the embarrassing failure. Somehow, Lotus found an even crazier concept to take the Coventry Climax's place. Now left without a suitable engine for 1966, Lotus resorted to boring the existing FMWV V8 out to its maximum attainable capacity of 2.0L, while waiting for a proper motor to replace it. The choices were however incredibly limited. Only five candidates had presented themselves so far, with two of them being Italian. Sparing himself to shame of even attempting to run a Ferrari or Maserati V12, and being unable to secure use of the Brabham-exclusive Australian Repco V8 or the Weslake V12 destined for Eagle, Colin Chapman ended up closing a deal with British Racing Motors. BRM had coincidentally also been developing a 16-cylinder engine, but it was unlike anything anyone had ever seen. Unlike the two earlier projects, the P75 concept was not born out of wildly inappropriate engineering megalomania. In fact, it was the exact opposite of that. With money and time in short supply, BRM had used the existing P56 1.5L V8 as the base for the new titan. In doing so they saved precious time and money, as many parts used in the V8 could be retained in the new design. The reasoning behind the fantastically ambitious engine was sound, but the developmental shortcut appeared to be causing a a fair share of other unforeseen problems. To cope with the extra power and weight of a larger engine, Colin Chapman had based his new 43 on the Indianapolis 500-winning 38 Indycar, since the American series allowed much bigger motors. His efforts to strengthen the chassis would prove to be dearly needed. The arrival of the first P75 engine brought some bad news. Owing to its extremely complex layout, the immense engine was so heavy it required six burly Lotus mechanics to even get it off the truck and into the workshop. Upon inspection, the H16 turned out to weigh as much as 230 kilograms (508 lbs), more than the chassis itself. The vast engine was mounted to the chassis as a stressed member in a similar fashion to that of BRM’s own P83. This would normally improve rigidity and by extension handling, but the engine had some more tricks up its sleeve. Because of its immense weight and very high center of gravity, the H16 effectively ruined Chapman’s carefully constructed chassis. Adding insult to injury, the “stacked-8” configuration’s already appalling top-heaviness was further ruined by the fact it needed to be mounted even higher up to allow the bottom pair of exhaust manifolds to clear the tarmac. The extra exhausts and the engine’s sheer width also prevented any other construction method from being used, as there was simply no space left around it to put a subframe. As it happened then, the invention of the stressed engine was something of a coincidence. As if the cumbersome size wasn’t enough, the P75 managed to give very little in the way of performance. Its 395 horsepower was definitely competitive in the early days of the 3.0L era, it produced its power in a very volatile and peaky manner. At 7500 rpm only 280 horsepower was available, with peak power not coming on until 10.500 rpm had been reached. The incredibly narrow power band made it virtually very inconsistent and virtually undrivable, as there was no telling when the power would come on, and if it would stay on long enough. Moreover, the engine suffered from potentially fatal internal balancing issues much like the earlier Conventry Climax. BRM had tried to remedy this issue with makeshift balancing weights, but the threat of a catastrophic engine failure loomed. It became painfully clear the two flat-8's didn't like each other very much. As part of the deal, Lotus started racing a 2.1L version of the BRM P56 V8 in the older 33 for the time being, while the first 43 was awaiting completion. The unexpectedly fat H16 required extra strengthening work on the chassis, which delayed the car’s debut to the second round of the season, the Belgian Grand Prix at Spa Francorchamps. The 43 was fitted with BRM’s in-house developed T-82 6-speed manual transmission, specifically designed to cope with the H16’s extra power. The finished car tipped the scales at a predictably chunky 563 kg (1241 lbs). By comparison, Brabham’s BT19 weighed 45 kg (99 lbs) less. However, Colin Chapman’s clever lightweight design made the 43 some 108 kg (238 lbs) lighter than BRM’s own P83. Peter Arundell in practice, 1966 Belgian Grand Prix. Team Lotus finally debuted the car in practice for the Belgian Grand Prix. There it was given to Peter Arundell (GB), a two-time podium finisher who had been with the team since 1963. Unsurprisingly, Arundell only managed three slow laps before the big H16 gave the ghost. As it turned out, the balancing weights intended to calm the engine’s vibrations were poorly fitted, leading to them flying off and wreaking havoc inside the engine. The French Grand Prix at Reims went little better, as Peter Arundell only managed 16th out of 17 starters, before conking out on lap 3 with gearbox failure. Clark in the pits at Monza. The disappointing performances in Belgium and France moved Colin Chapman to sideline the 43 for three races, as he considered it far from race-ready. Because of this, the car didn’t make a return until the seventh round of the season, the Italian Grand Prix on the scarily fast circuit of Monza. Now in the hands of defending champion Jim Clark, the 43 was about to be tested to its very limit. Surprisingly, it duly delivered. The high average speeds at Monza compensated for the overweight package and the engine’s unpredictable performance, as the H16 was one of the most powerful on the grid when running well in top gear. Jim Clark steps into the 43 for the first time, Monza 1966. The power advantage propelled Clark to third on the grid, a far cry from the dismal 16th Arundell had managed in France. On race day the H16 was running better than ever, and Jim Clark was able to fight for the lead. Unfortunately though, the 43 suffered a flat tire early on, forcing the Scotsman to pit. Ten laps before the end of the race, he was making up for lost time and flying through the field, only to succumb to gearbox-related woes on lap 58. An appearance at the non-championship International Gold Cup at Oulton Park was equally unsuccessful, as the car failed to start after its engine grenaded again. Jim Clark making his way to the grid, Watkins Glen 1966. The next race on the calendar was the United States Grand Prix, held on the fast and flowing circuit of Watkins Glen. Like at Monza, the H16-engined Lotus stood a good chance of grabbing a top position. Special motivation came from a top prize of $20,000 for the first place finisher, a huge amount of money in 1966. Jim Clark drove his heart out in the unruly 43, and nearly grabbed pole position. Fellow two-time champion Jack Brabham (AUS) had only just pipped him to the top spot by slightly over a tenth of a second. Clark had little time to be pleased with the result, as the BRM had exploded in a flurry of oil just moments after setting its fastest lap time. An aggressive start from Clark, 1966 US GP. 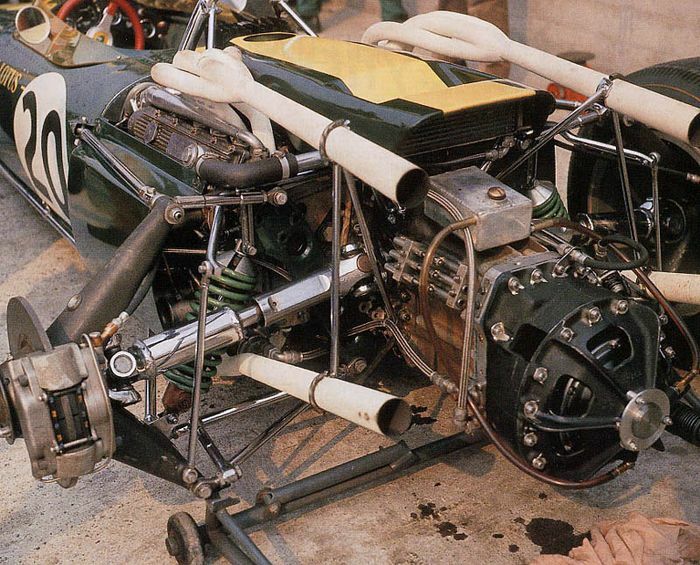 With no spares left, Lotus were forced to adopt a heavily used spare engine from BRM for the race on Sunday. The team worked round the clock that night to complete the engine change. With Saturday’s blowup still fresh in his mind, Jim Clark agonized over which car to use during the race, but the power of the H16 finally convinced him to stay put. As he lined up for the warm up lap, the engine was already leaking oil, but his mechanics spotted the problem and tightened things back up. In a chaotic race, Clark found himself battling for a place in the top five, but several incidents lead to his advancement through the ranks. Jim Clark and his smoking 43 in the closing stages of the race. A tangle between John Surtees (GB) and Clark’s teammate Peter Arundell dropped the Cooper driver back to P13, as Surtees engaged in a heated shouting match in the Lotus pits despite his car being totally fine. Surtees then stormed back up through the field, but a good finishing position seemed impossible. A succession of engine failures for both Ferrari’s Lorenzo Bandini (ITA) and Jack Brabham completely turned the race around however, as Jim Clark inherited the lead. With over a minute between him and second-placed man Jochen Rindt (AUT) and his Maserati-powered Cooper T81, the win looked in the bag. All he had to do was finish. As if by a miracle, the increasingly smoky H16 held together, and Jim Clark took the grand prize on the top step of the podium. Jim Clark, 1966 Mexican Grand Prix. Jim Clark continued his run of good qualifying performances with second on the lightning-fast track of Ciudad Deportiva Magdalena Mixhuca in Mexico. The H16 was again well at home on the long straights and quick corners, and for once stayed in place long enough to do both qualifying and the race. Sadly though, the gearbox had other plans yet again, leading to an early retirement nine laps into the race. With the 1966 season wrapped up, Lotus could finally focus on regrouping after what had been a tremendously tough transitional year. Graham Hill in the pits, Kyalami 1967. By the start of the 1967 season, Colin Chapman was eagerly awaiting the completion of his latest weapon in the new three liter wars. In deepest secrecy, he had forged a bond with engineering firm Cosworth, who would produce a bespoke Grand Prix engine with backing from automotive giant Ford. This Cosworth DFV V8 was incredibly promising, leading Chapman to ensure exclusive use of it for 1967. However, it became clear the Cossie was going to take a while. As a stopgap, the 43 was pressed back into service complete with H16 to contest the opening round of the season. Jim Clark at Kyalami, the final outing for the H16-Lotus. South Africa’s Kyalami was a good venue for the car, as it had similar properties to Monza, Watkins Glen and Mexico. High average speeds ensured the ageing car would at least have a fighting chance in this first ever Formula One race held at the swooping track. Two Lotus 43’s were shipped to the tip of Africa this time, with the second built for 1962 World Champion Graham Hill (GB), who returned to the team after 6 years with BRM. His tenure with BRM suggested he would have no problem with the much lighter Lotus, but his 15th place on the grid paled in comparison to Clark’s 3rd. In the end it didn’t matter in the slightest though, as Hill crashed his car on lap 6, and Clark suffered a familiar engine failure 16 laps later. And with that unceremonious end, the H16’s tenure at team Lotus was over. Jim Clark at the International Gold Cup, Oulton Park 1966. The Lotus 43 BRM is a car born out of pure, unadulterated necessity. In the chaos following Formula One’s surprise switch to 3.0L engines, Colin Chapman had no choice but to partner up with BRM in his quest for sheer survival. With the weak and outdated 1.5L engines bored out to within an inch of their lives, and better-prepared engines threatening his attempt to defend the championship, the stupefying H16 was the only option. Unfortunately his gamble failed to pay off, as one after another then engines exploded and gearboxes seized. The incomprehensibly complex, dramatically heavy, and woefully engine was conceived as a way to conserve funds and time, but only managed to increasing spending and caused long nights in the garage. The H16’s peaky power delivery and clunky gearbox meant it was usually at anything but an intensely fast track. But when it finally fired on all cylinders, nothing could produce more sheer power. The impressive grunt produced by the P75 made it very competitive on the sport’s fastest tracks, but reliability continued to be a major concern. However, the engine cemented itself in the record books thanks to the extremely capable hands of a true racing legend. With a helpful dose of luck, Jim Clark drove the mad clunker to an unprecedented victory at Watkins Glen. In doing so he not only cashed a major novelty-size check, but also became the first and only driver to win a Grand Prix in a sixteen-cylinder car.